Together they will travel more than 500 miles, through forests, mountains, and desolate tundra. The entire forest, growing in a shallow layer of soil, sits on ice and frozen dirt that is tens of thousands of years old. 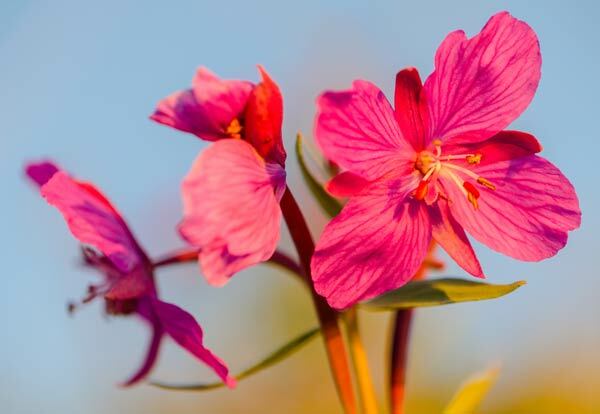 The research team wades through a field of waist-high, vivid pink fireweed that’s alive with the buzzing of bees. Smoke from nearby forest fires partially obscures the bright sun, and the smell permeates the air. It’s the team’s first day of fieldwork, and they are a 20-minute walk from the edge of the University of Alaska Fairbanks campus. 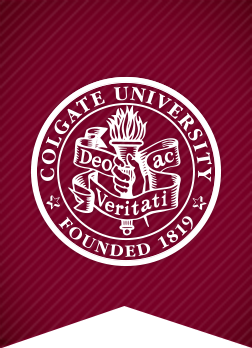 Colgate professor Mike Loranty is following GPS coordinates that lead the group to a narrow trail at the edge of a shady forest. The students, each wearing a pristine pair of muck boots, are about to enter the boreal forest for the first time. Loranty swats at a mosquito and announces that it’s about to get “buggy.” The students grab brand-new bug jackets from backpacks filled with equipment and pull them on over unseasoned field gear. 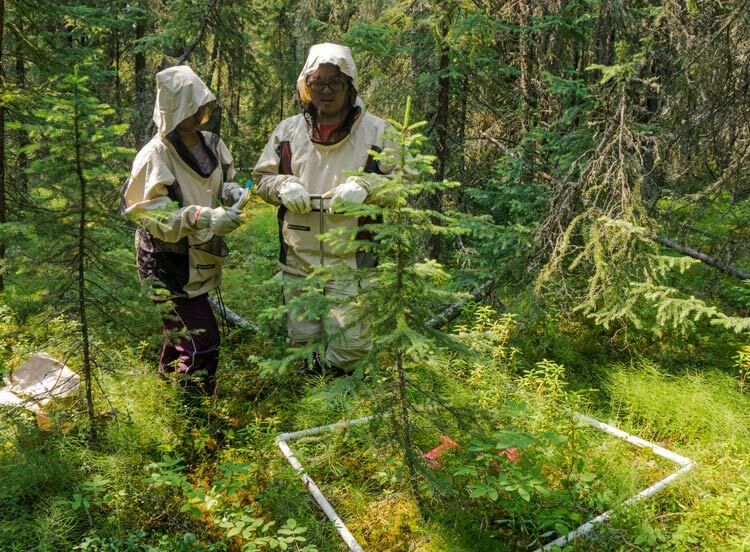 With the hoods zipped up, the jackets look like hazmat suits, making one wonder: just how bad are the famed Alaskan mosquitoes? One by one, the seven team members disappear into the forest of pencil-like black spruce trees that are punctuated by white spruce and aspen. The contrast goes beyond the trees. Although it’s July, and the air temperature is 80 degrees, just a few inches below the surface of the ground, it’s frozen solid. This is permafrost. The entire forest, growing in a shallow layer of soil, sits on ice and frozen dirt that is tens of thousands of years old. 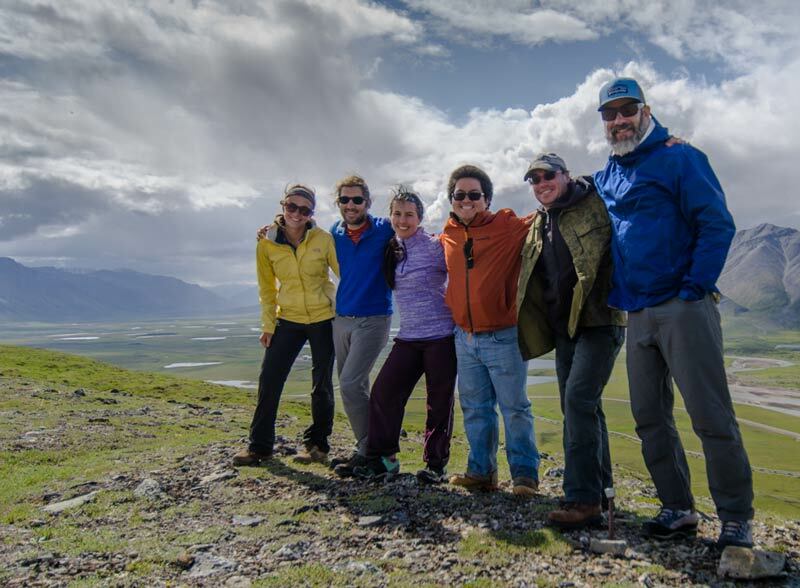 Meet Team VIPER (Vegetation Impacts on Permafrost), which includes three Colgate students: Lindsay McCulloch ’16, Karl Uy ’17, and Alaina Norzagaray ’18. 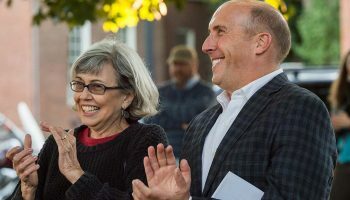 Along with Loranty, an assistant professor in geography, they are joined by Alexander Kholodov, research associate at University of Alaska Fairbanks; Katie Heard, a field assistant from Woods Hole, Mass. ; and Buffalo, N.Y., high school teacher Stan Skotnicki. Together they will travel more than 500 miles, through forests, mountains, and desolate tundra, from the warmth of the interior to icy winds blowing off the Arctic Ocean, all in the unending daylight of midsummer. 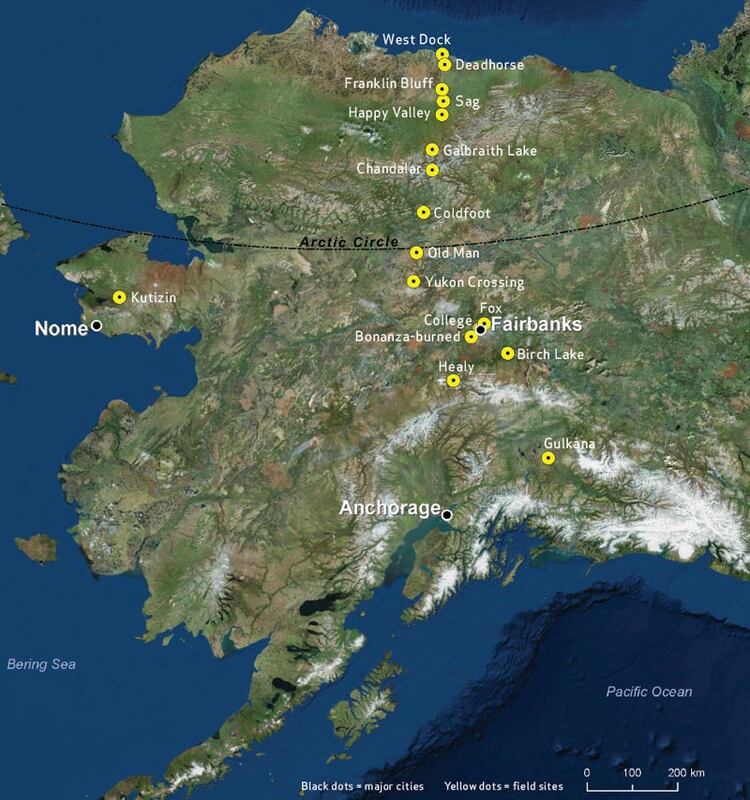 Over the next five weeks, Team VIPER will collect data from 24 sites across Alaska. The students aren’t the hardy Arctic explorers of bygone days. McCulloch is the only one who has field experience, and that was in the jungle; life in the mountains and the tundra is new to them all. Yesterday, they practiced spraying an imaginary bear with an empty can of bear spray. Today, they each have a can latched to their backpacks for the very real threat of being charged by a grizzly. 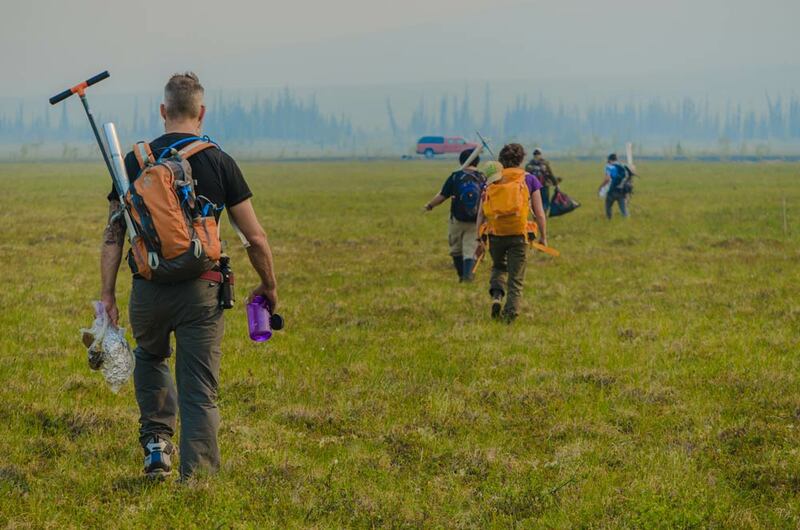 Loranty guides the group to the first research site, where they dump out their packs, which hold 330-foot-long measuring tapes, rulers, pencils, colored Sharpies, shears, handsaws, calipers, a long metal depth probe, a soil core sampler, tin foil, stacks of paper, and plastic bags. It’s everything they need to study Arctic vegetation and permafrost. Permafrost is ground that’s been frozen for at least two years. The thickness of the permafrost layer increases further north, extending up to 2,000 feet below the ground in some spots. It’s been there for thousands of years, but it can’t withstand the warming climate — it’s starting to thaw. Permafrost stores organic carbon from plant and animal matter that hasn’t decomposed. When carbon is sequestered in permafrost, it is essentially no longer part of the global carbon cycle — the means by which carbon moves through the environment and the atmosphere. But as permafrost thaws, microbes break down the organic material and release methane and carbon dioxide into the atmosphere. The carbon that took thousands of years to accumulate in the permafrost is now rapidly being released back into the cycle, which will amplify global warming. But how quickly permafrost thaws is influenced by the area’s geology, hydrology, and the soil and vegetation on top of it. Different combinations of vegetation and soil have varying capacities to protect the permafrost from thawing. 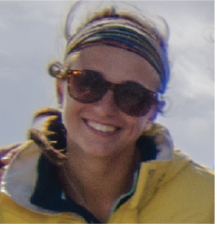 And that’s why Loranty is here — to study how vegetation influences permafrost temperature. How quickly permafrost thaws is influenced by the area’s geology, hydrology, and the soil and vegetation on top of it. Before they can begin, however, the team has to learn how to set up the sampling site. Loranty hands one end of a measuring tape to Norzagaray, and he uses a compass to direct her northward as she unravels 65 feet of tape. 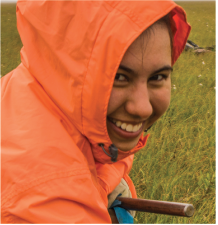 She lays down the first transect — the straight line along which they will take permafrost and vegetation measurements. She wades through pools of muddy water, climbs over branches, and pushes through prickly bushes and dead tree snags as she unrolls the tape measure. The muck boots quickly live up to their name. Uy and McCulloch lay out two more transects, parallel to the first, 50 feet away. Finally, they set up the vegetation plots and soil sampling sites at either end. Now they can start. The top layer of soil thaws each summer. This is called the active layer, and includes both the upper organic layer and a deeper mineral layer. The organic layer mostly consists of decomposing organic matter like moss, as well as roots. The mineral layer is dense and claylike. Directly beneath the active layer is the permafrost, and they measure its depth using a thaw depth probe. But that’s only one of the measurements. For the next five hours, Loranty moves among the group, explaining how to: measure the basal diameter of a tree; use the densiometer to estimate forest canopy cover; classify woody debris, soil depths, and tussock diameter; differentiate between organic soil and mineral soil; dig soil samples; clip and classify vegetation; and use a GPS. All this, while keeping an eye out for bears. Working within the three transects, the researchers can calculate an average of all the vegetation at that site. They quantify the trees, shrubs, mosses, lichens, and grasses as well as the properties of the soil they grow in to derive an ecosystem inventory. They then relate what they find to the temperature and depth of the permafrost below. “Hopefully, all of this will give us a good picture of what’s going on at this site,” Loranty said. 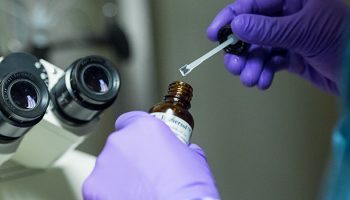 The data they are collecting in Alaska is only the beginning of a larger, National Science Foundation–funded, trans-Arctic project. 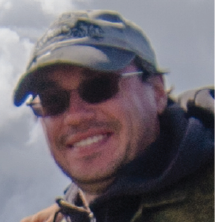 For the next four years, Loranty, Kholodov, collaborator Sue Natali from Woods Hole Research Center, and colleagues in Russia will collect similar data at sites in Siberia. Combining satellite images with the data they collect on the ground across the Arctic, they will develop a three-dimensional snapshot of the Arctic ecosystem. They can use this data to develop a model that will help predict which parts of the Arctic will thaw faster than others. It’s up to Team VIPER to gather the first data points of the project across a wide swath of Alaska. They’ve learned the ropes in Fairbanks. Now it’s time to head north. Signs of civilization dwindle as the team turns onto the start of the Dalton Highway, 84 miles north of Fairbanks. The Dalton Highway was built in 1974 to supply the Trans-Alaska Pipeline, and for 414 miles, the mostly gravel road courses through some of the world’s most spectacular scenery. Until 1994, tourists were required to have a permit to drive past mile 211, a spot with the inspirational name “Disaster Creek.” Today, travelers just need a decent truck and nerves of steel. Massive, speeding semi-trailers spew gravel as they zip around blind corners and over hills. But the team’s big red truck — dubbed Clifford — and Kholodov, who’s driving, are up to the task. The group stops for a lunch of salmon burgers at Yukon River Crossing. It’s the first of only two opportunities along the highway to replenish resources (and buy bumper stickers declaring “I crossed the Arctic Circle”). The Arctic Circle — actually 60 miles north of Yukon River Crossing — may be only a line on a map, but it holds an unmistakable mystique. When the team arrives, everyone jumps out to scramble on top of the official sign and passes around cameras for obligatory group and solo shots. Turns out, crossing the Arctic Circle really is worthy of a bumper sticker. For most tourists, this marks the turnaround spot. For Team VIPER, the Arctic adventure is only beginning. It’s up to Team VIPER to gather the first data points of the project across a wide swath of Alaska. Eight hours after leaving Fairbanks, they reach their destination: Coldfoot (population: 10). Coldfoot is the world’s northernmost truck stop, and the second and final chance to get supplies. Here, the field site is in a mountain valley, and it’s misty, windy, and rainy. These are excellent conditions — as Loranty and Skotnicki later discover — for fishing for Arctic grayling in the Middle Fork Koyokuk River in the evenings. The team stays two nights in the hotel (a series of attached trailers), and heads north again. Each field site is unique. One warm afternoon, the group is working in a wide, treeless valley at a site named Old Man. The ground vegetation is mostly spongy moss, inviting and soft. The next day, they’re at Chandalar Shelf, deep in the rugged Brooks Range, where the ground is damp, with deep tussocks and dense shrubs. It’s windy and cold, but nothing detracts from the breathtaking views. It’s hard to resist just watching the clouds roll over the mountains. Working together, they have quickly learned the ins and outs of Arctic research. Now, when the team unloads gear at a site, everyone calls out their preferred task. McCulloch grabs a soil saw, tin foil, and bags, and settles at one end of a transect to start cutting soil samples. Uy places the vegetation plot frame on the ground, and clips vegetation, his favorite job. He can already distinguish evergreen from deciduous shrubs, placing lichens, mosses, and grass all into their correct pre-labeled paper bags. The students are all in different class years, with varying experiences and ideas of what they want to do in the future. But they have one thing in common: they’re excited to be here. They each approached Loranty about taking part in this project the previous year. Uy, whose smile and singing never faded the entire time, said he’d been anticipating this trip for six months. Meanwhile, McCulloch has been working on her own side project in Alaska, separate from Loranty’s, looking at the ratio of living to dead roots in the soil. Loranty helps her work through the process and they discuss ideas as they dig through soils together. But ultimately, he leaves it up to her to decide what direction her project should take. After only a few days in the field, she’s already directing the rest of the team how to separate roots and what size samples she needs. “It’s nice to have ownership over something,” she said. Loranty’s approach is that the students should have the space to learn and figure things out for themselves. He rarely tells anyone directly what to do, because he just expects them to work hard in the field and do what needs to get done. 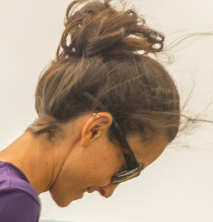 Each day, the team gets more streamlined and Loranty is pleased with their progress. In between jokes and endless movie quotes, he talks about his experience as a graduate student and now professor, and how he’s had to become a sort of jack of all trades. On the surface, he is the definition of laid back. But he is also a former competitive road and mountain biker, and his ambitious spirit feeds into his work. His background is in geography and remote sensing — far removed from picking grasses. But anything he needs to learn, he does. 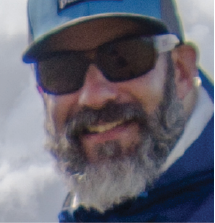 From programming in UNIX, to plant physiology, to ecosystem ecology — he’s built an arsenal of skills that he can now teach. “Teaching something is the best way to learn it,” he said. For most tourists, this marks the turnaround spot. For Team VIPER, the arctic adventure is only beginning. At one point, McCulloch is elbow deep in freezing mud, and Norzagaray and Uy are chatting while they separate mosses from lichens. Loranty suddenly pops up and, only half joking, yells out, “You’d better be looking for bears!” Needing little prodding, Uy starts singing “The Lion Sleeps Tonight” loud enough to give any bear second thoughts about approaching. He continues to sing while they pack up their gear and head back to the truck. They still have a long way to go. The Trans-Alaska pipeline snakes alongside the highway. The underground ice and permafrost cause powerful shifts in the landscape, making trees fall and structures collapse, so huge stretches of the 48-inch diameter pipe are perched on stilts. At mile 235, the team waves goodbye to the last tree as they speed past the tree line. This far north, only grasses, moss, and shrubs grow. There used to be an “official” last black spruce, thought to be more than 270 years old. But in 2004, a vandal cut it down. The “Last Tree” signpost, however, remains intact. For the next 180 miles to the shores of the Beaufort Sea, there’s not a spruce in sight. 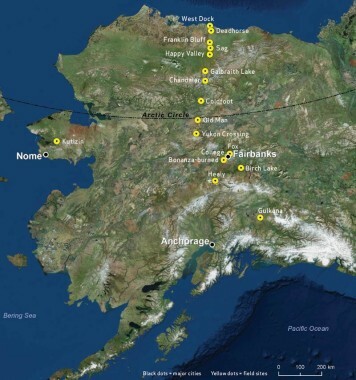 The 240 miles from north of Coldfoot to Prudhoe Bay, the end of the road, is the longest stretch of road without services in North America — unless you’re a scientist. About halfway, there is a polar oasis: Toolik Field Station. The motley collection of buildings sitting on the southeast edge of Toolik Lake includes lab buildings, a recreation center that hosts Saturday night karaoke, equipment workshops, garages, and a series of Weatherport tents that serve as bunkhouses. The Arctic is a complex ecosystem, and Toolik is the perfect place to exchange ideas and observations with other researchers. The cafeteria produces endless gourmet food, and the homemade ice cream means the “Toolik Ten” — the 10 pounds you gain during your stay — is no exaggeration. It’s the Club Med of field stations, albeit Club Med with outhouses and water-use restrictions that limit you to two, two-minute showers a week and laundry twice a month. But, you can always supplement your washing schedule with a visit to the exquisite lakeside sauna and a swim in Toolik Lake. “I like to describe it as summer camp on steroids,” McCulloch said. 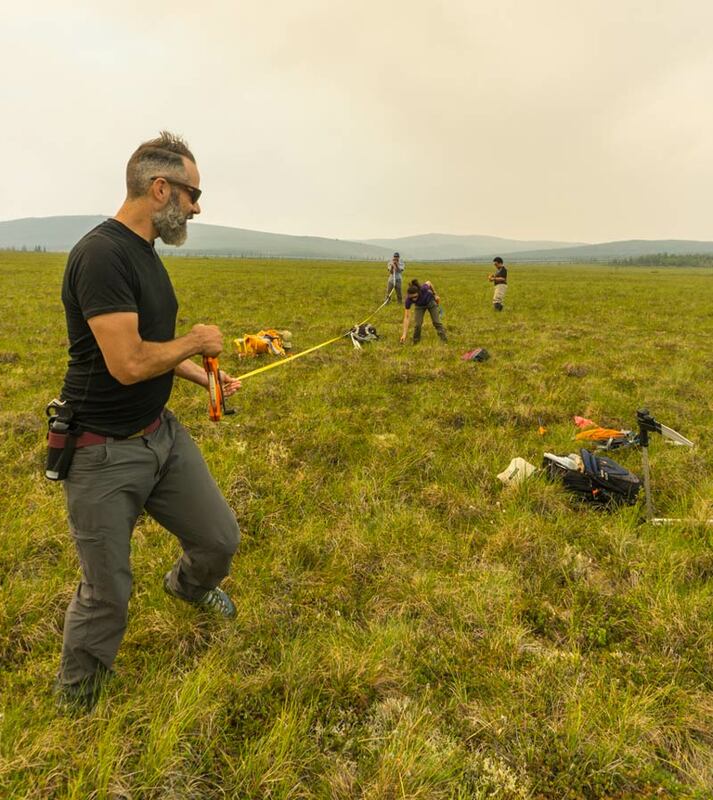 From Toolik, the team collects data from multiple sites on the tundra. One site, called Happy Valley, is only 100 yards off the road. But the team checks two and three times to ensure that they have everything they need — nobody wants to make the trek more than once. This site has tussocks. These mounds of grass that grow in clumps are close enough together that, from a distance, they give the illusion that walking across the tundra will be an easy stroll across a grassy plain. But the grass sprouting from the top of each tussock obscures the cold, squelching, knee-deep water and mud that collects between them. “The most dangerous thing I’ve had to deal with are tussocks,” Uy joked as he stumbled, yet again, and sank into a particularly deep fissure. Every step is a slog. After the bold beauty of the mountains, the tundra’s appeal is more subtle. Long-tailed jaegers soar overhead. Harrier hawks hunt, while little brown sparrows and longspurs flit along and disappear into the grass. 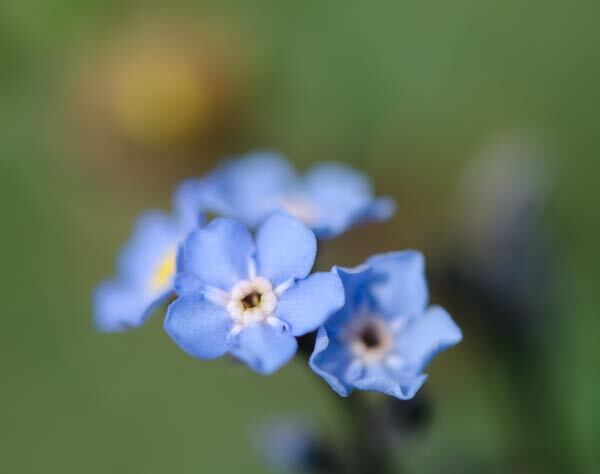 The ground is covered in flowers: bright-yellow Arctic poppies and snow buttercups, white puffs of cotton grass, tiny blue Arctic forget-me-nots, and the aptly named pink River Beauty. The growing season is short, but the flowers make the most of it. As do the mosquitoes. 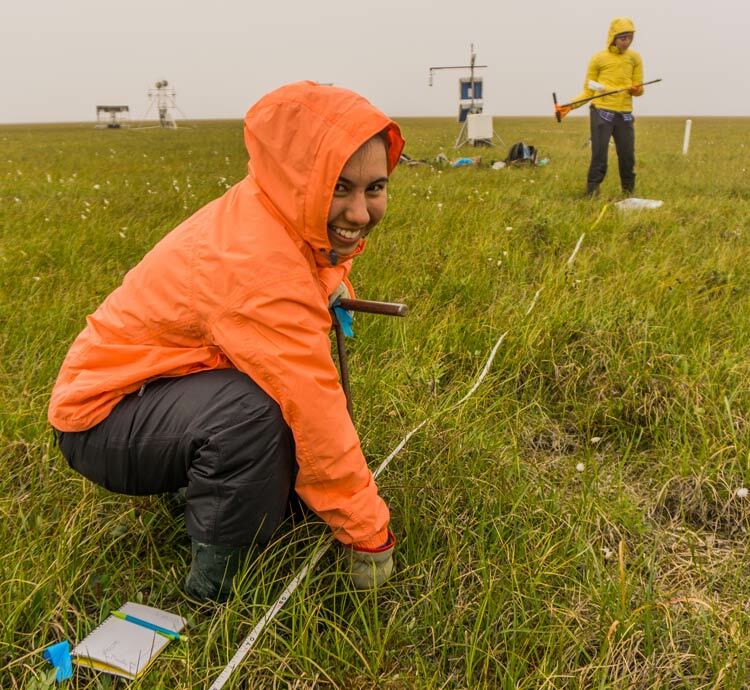 With her bug jacket zipped up, Norzagaray grabs the thaw depth probe to measure the depth of the active layer — the soil that thaws during the summer months and provides water and nutrients for the growing vegetation. Taking 21 measurements along each transect, she pushes the metal probe into the ground. In some places, the probe thunks into permafrost only 6 inches down. But elsewhere, she plunges it 30 or more inches before it stops, and it takes all of Norzagaray’s strength to pull it out again. “[It’s] like pulling the sword from the stone,” Loranty said. Crouching nearby, almost disappearing in the shrubs, Kholodov prepares to measure soil temperature and insulative properties. Each site is located next to a borehole ranging from 15 to 200 feet deep. The boreholes are fitted with sensors to measure permafrost temperature. As Kholodov digs near the borehole site, he explains how different vegetation can insulate the underlying layers. 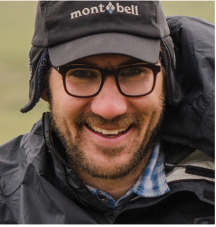 “In general,” he said, “boreal forest is a very good ecosystem to protect permafrost.” The snow in the winter and the thick moss in the summer temper the warming impact of the air. 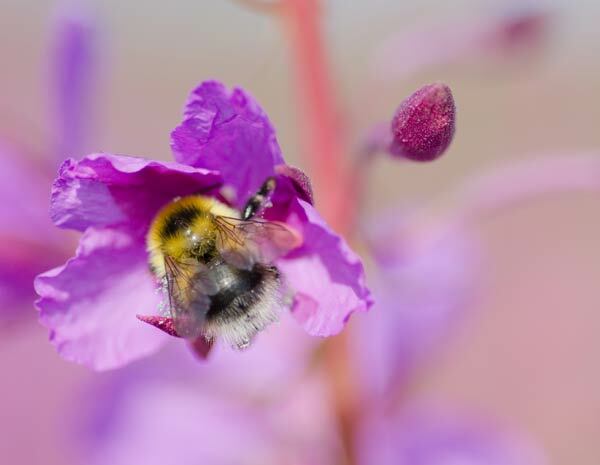 But, he added, a thick layer of organic soil, or the presence of tussocks, can also lead to colder permafrost temperatures. He records the temperature, moisture content, and conductivity of the soil layers. The more conductive the soil, the less insulation it provides, so a thick, air-filled organic layer is a better insulator than the dense, moist mineral layer below. The group spends hours in Toolik’s Lab No. 5, processing the soil and vegetation samples. They dry and weigh the vegetation, allowing them to estimate its overall mass and the relative proportions of grasses, shrubs, lichens, and moss growing in each location. Next, they measure carbon content of the organic and mineral soils. They put the dried and weighed soil samples in a muffle furnace at 930 degrees F, which burns off all the carbon. When they weigh the samples again, the difference tells them how much of each sample was carbon. Finally, they all pitch in to help McCulloch with her root system research. 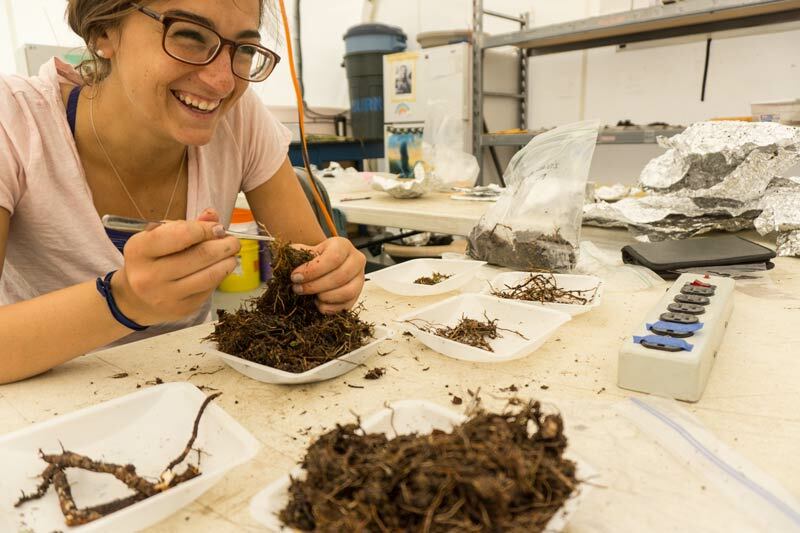 While one person washes soil samples through fine sieves, the others spend hours hunched over tables, helping her tediously tease apart roots, separating them into living and dead, and categorizing them by size. They even run into a recent Colgate graduate there. Salvatore Curasi ’15 majored in political science and geography, with aspirations for law school. A trip to Siberia with Loranty in 2014 convinced him to exchange a business suit for field clothes, at least for now. 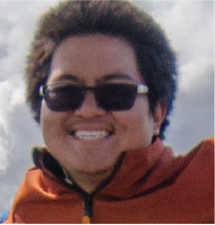 He’s using remote sensing skills he learned at Colgate to pursue a doctorate at Notre Dame University. For hundreds of miles, the magnificent landscapes of the Brooks Range and the North Slope elicit countless superlatives from the group, while they discuss their favorite spots along the way. But at the end of the road, mile 414, they are greeted by row upon row of machinery and spare parts used in the oilfields of Prudhoe Bay. It’s an almost post-apocalyptic scene, and a jolting reminder of the reason for the existence of the Dalton. There are no restaurants here. The only store sells junk food, work clothes, and odd souvenirs at exorbitant prices for the few tourists who make it this far. Here, Team VIPER finishes the last few sites. The wind blowing in from the Arctic Ocean keeps the temperatures near freezing even in midsummer. By the time they reached the open tundra of the North Slope, the Arctic had changed them. Along the way, the group has together climbed cliffs, hiked mountains, swam in Arctic lakes, and seen musk ox, moose, and rainbows. But each student came on this adventure with his or her own personal goals. They were neophytes in the forests of Fairbanks, but by the time they reached the open tundra of the North Slope, the Arctic had changed them. For Norzagaray and Uy, new to the rigors of fieldwork, they had proven something important — that they could do it. The students have only begun to scratch the surface of Arctic research. 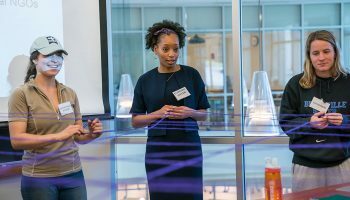 Some may continue, while others might ultimately take different career paths. But no matter what field they find themselves in, they won’t soon forget how it feels to reach down through the cool soil and touch the solid icy permafrost with their fingertips.